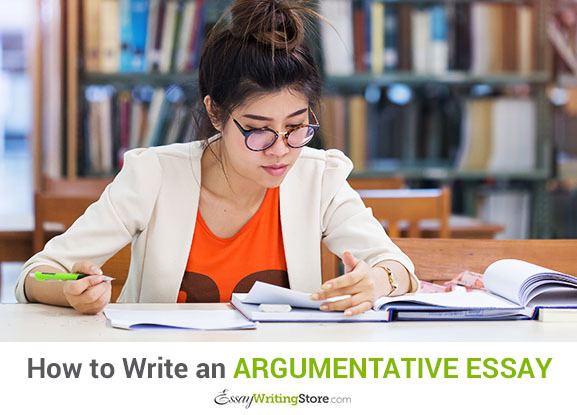 Many students wonder how to write an argumentative essay properly even though argumentative writing is one of the most frequently assigned types of writing. Since students often lack basic knowledge in writing argumentative essays, they find this type of papers rather challenging. When one is given a task to write an argumentative paper, he/ she is expected to come up with good argumentative essay topics, investigate the chosen topic, gather relevant information pertaining to the subject, and put forward the central claim outlining the author’s position on the paper. All in all, regardless of the topic, the essay has to be written in a logical and succinct manner. Nota bene: some students are confused and cannot properly differentiate between an expository essay and an argumentative one. They are actually similar but argumentative writing involves more research and collection of information. Besides, writing an argumentative essay entails a pre-writing stage and a more lengthy process of actual writing. Expository essays, on the other hand, are shorter than argumentative ones and do not involve in-depth research or thorough analysis of the topic. After you have decided on the topic, switch over to data gathering stage. Particularly, you are encouraged to devote sufficient time on researching literature on your topic and on topics adjacent to yours. Some argumentative papers demand studying empirical data, such as experiments, questionnaires, surveys, and interviews. Thorough research of literature on the topic helps a student gain more in-depth understanding and select a position to support or argue against. The gathered data will enable a student to provide adequate supporting data to back up the central essay claim. The opening paragraph of the essay is the introduction, where you provide background descriptive information on the topic. Sometimes, you need to provide more descriptive facts in case the topic is not well-known to your target audience. In other words, you should set the context for your paper and also pinpoint to the topic significance and why it is worth discussing at all. It should be clear to the audience why they should care about the subject and should be particularly interested in the ideas development. At the end of the introductory paragraph, make sure to provide a clear and argumentative thesis statement. Here you need to communicate the central message of the whole paper. The thesis statement should be formulated in a clear and concise manner in order not to confuse the reader. If a student fails to provide a proper thesis statement, he/ she will obviously fail with the essay as readers won’t get the idea of the paper. When writing an argumentative essay, a student should ensure there are sufficient transitions between sentences and body paragraphs. These are the building blocks that stick the paper together and emphasize on the logical relations between the ideas. Without these transitions, it would be hard for a reader to follow the main idea, trace the argument, and thus comprehend the overall structure. The main purpose of the transition is to provide a smooth flow from the previous paragraph to the next one. What is an argumentative essay? It is a type of academic paper that requires sufficient evidential support. Besides, when coming to the organization of body paragraphs, each of them should be united by a single idea. Such an approach to paper structuring will ensure logical direction and clarity all over the essay. Besides, such organization of the essay into paragraphs will ensure easiness of comprehension and readability. It is equally important to connect the topic idea of each body paragraph to each of the aspects mentioned in the thesis statement. Moreover, it is crucial to explain and pinpoint how the evidence presented in the body paragraphs supports the thesis statement. Despite the fact that the argumentative essay should convey one central idea, it should as well explain different aspects pertaining to the chosen topic. Considering the length of the essay, a student should dedicate at least one or two paragraphs to discussing a counter-argument. At this point, it is important not only to provide information on the opposing viewpoint but also to refute this argument by pinpointing to why it is not applicable. Regardless of the type(s) you prefer to use, you should keep in mind that you need to choose only credible evidence from reputable sources. An important point in providing supporting evidence is to make sure it is taken from new sources. Outdated sources should be avoided as they usually provide data and facts that are no longer topical. When providing evidence for the essay, also make sure to discuss opinions that do not directly support the thesis. Excluding evidence that does not back up the ideas expressed in the thesis is easy but is not the right way to handle a certain topic. It is advisable to explain how and why other opinions are not relevant. After you have properly discussed and analyzed the topic throughout body paragraphs, it is high time to wrap up your ideas in the conclusion. In light of the supporting evidence that you have provided, try to restate the thesis by focusing on the essay results or outcomes. Make sure not to repeat the previously expressed information word-for-word but to provide a logical and effective summation of the paper. When writing the conclusion, make sure that you do not include any new information in the essay. Emphasize on the topic significance and state once again why the topic is important to consider. Overall, when discussing the right way of organizing an argumentative essay, the most common answer is to structure the material into a five-paragraph paper. Undoubtedly, the number of the essay paragraphs is determined by the paper length and sometimes a long essay should have sections instead of mere paragraphs. Still, this is not the only possible way of structuring the paper, although a five-paragraph paper is the easiest way of organization: it has an opening paragraph, three body paragraphs, where sufficient examples, illustrations, and supporting evidence are presented, and a summative paragraph wrapping up the core ideas. When you are required to provide a long argumentative essay, you should correspondingly carry out a more extensive analysis of literature and other sources. As well as that, such a paper is expected to be longer than just five paragraphs. The topics assigned for long argumentative papers are mainly more complex and more complicated. As a rule, these are some controversial topics that are urgent nowadays. 1. Get to know the main aim of writing an argumentative essay on the assigned or selected topic. The core purpose of argumentative academic writing is to research the topic in depth and cover all possible areas pertaining to it. Besides, when thinking of paragraph development, consider how you can structure your argumentation in the best way: pinpoint to why a certain standpoint/ claim is better/ more trustworthy/ more convincing than others. 2. Clarify for yourself the methodology of an argumentative paper. Decide on the methods needed to convey specific information. Come up with the most relevant methodology that is used to convey the central idea. 3. Predict what the expected outcome/ result/ solution of the essay will be. How exactly can you convince the audience that your claim is plausible? Will the target audience be convinced in the end? 1. Try to select a topic according to the paper requirements, essay length, format, and subject (these are some of the core criteria). When choosing a topic, keep in mind that you will argue in favor of the given topic formulation. Also check whether you have sufficient contrary opinions to refute them further. For example, if you choose a topic that is easy to argue, i.e. that smoking is harmful for the general well-being, you would hardly ever find counter reasons that smoking is beneficial for your health. As such, this topic is weak and would not be properly argued. 2. Pick a topic that you find appealing and interesting. Naturally, you will be more eager to talk about something you find interesting and thought-provoking. As such, try to write about things that are interesting to you from the beginning. Avoid boring topics (because the whole writing process will turn into a nightmare), topics that are overdone by other writers and researchers, and topics for which it will be difficult to find any supporting evidence. 3. Consider your target audience. While your chosen topic should be definitely interesting for you, it should be also interesting for your target readers. For example, in a situation where the bulk of your audience comprises of religious representatives, it would be hard for you to narrate about situations when abortion is justified. You will waste your energy on resisting the pressure from your audience. Keeping your audience in mind will help you in the process of essay organization and in structuring ideas. You should also use different writing styles (in terms of language) depending on the audience. First of all, it depends on the professional realm of the audience, its educational background, age range, and other factors. The text (i.e. your argumentative essay). Each of the rhetorical situations denotes using specific language with the aim to persuade the audience accept your standpoint and agree with you. As such, employing them is vital if you want to submit a successful paper. 1. Take a break after writing. It will help you distance yourself from the text in order to be able to comprehend it in a brand new vision. If you start editing and proofreading straight after writing, you will be more prone to overlook serious flaws in the paper. Therefore, take a break at least for a few hours (preferable for a day or two) if you have sufficient time before submission. 2. First start looking for mistakes in content and structures. Check out whether you have sufficient logical transitions, whether the essay development is smooth and coherent, whether you have a properly formulated thesis, and whether the topic sentences at the beginning of each body paragraph are related to the thesis. 3. After you are done with content and general essay structure, switch over to finding minor flaws, errors, and typos. These involve grammatical, punctuation, and spelling mistakes. Take a look whether all verbs agree with subjects, whether all terms and proper nouns (and generally all the other words) are correctly written.